Crash Test Curry…new cooking class! The first open cooking class at Holi Cow in 2015…’The Crash Test Curry’ Course…I have been thinking of hosting this class for a while and I have finally put it together. Madras, Jalfrezie, and Vindaloo…don’t be intimidated by the fancy names! This course will take you through the technique of curry making and how to use the various spices used in everyday flop proof curry making. I have designed this course for home cooks that love spice but don’t have hours to spend in the kitchen. The ‘Crash Test Curry’ course covers Lamb Vindaloo, Chicken Madras, Fish Jalfrezie, and a delicious Aloo Mattar Gobi – a vegetarian curry with potato, cauliflower and peas. I will also demonstrate how to make Indian flatbreads or roti and a flop proof crème brulee. A sit down meal is served after the class where guests enjoy the spoils of the cooking class. 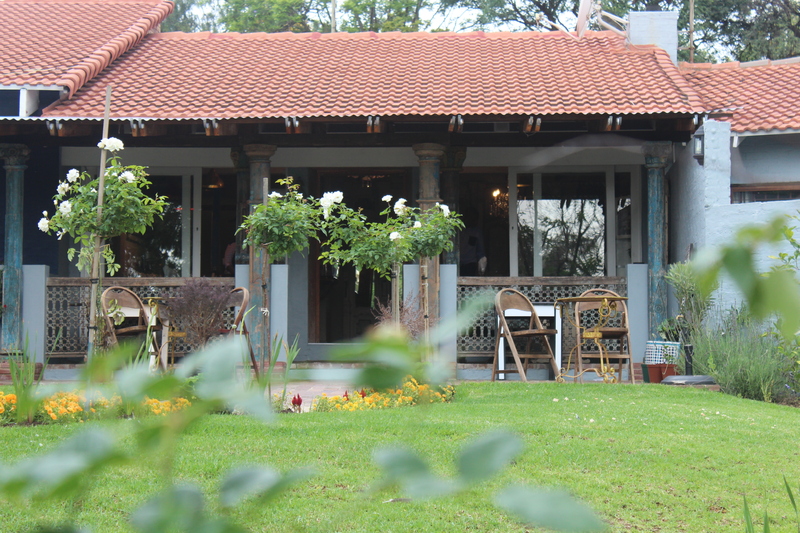 Call us at the Holi Cow on 011 – 467 2661 to make a reservation. Please take note that Holi Cow is not a licensed venue, so please feel free to pack some wine for your cooking adventure! The trouble with cooking classes….. I need a lie down….I really need a lie down. Every time I attend a cooking class, I make promises not to eat too much. I have a large breakfast and get to a demo thinking I am not hungry….maybe just a little taste! My little tasters always turn into feasts! We have just rolled back from a cooking class with Chef Kanit from the Amari Palm Reef Hotel in Samui, and my greed let me down again. We had occasion to try some of the chef’s food a few nights ago and we really thought it was fabulous. 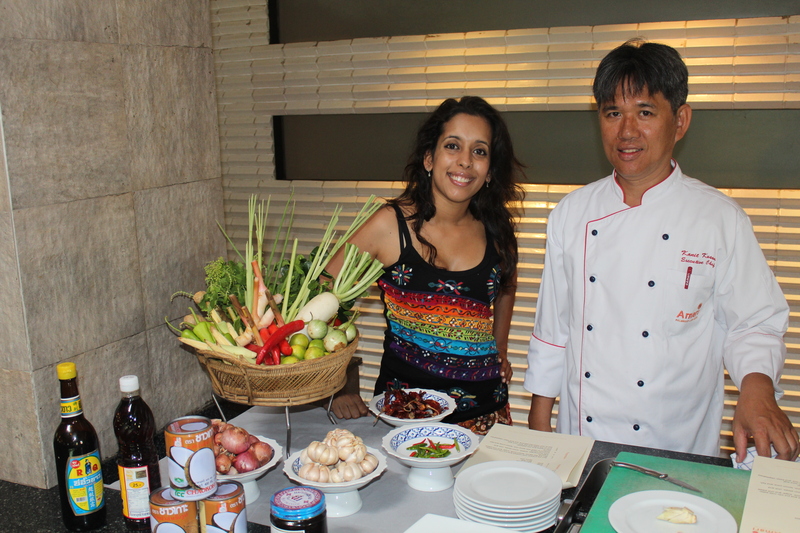 So, when the hotel’s resident manager, Martin, suggested a one on one cooking class, I jumped at the opportunity. After a morning spent lazing on the beach, we met with Chef Kanit who was ready to cook up a storm. Everything was prepared, every fresh ingredient had been chopped, sliced, diced and shredded. 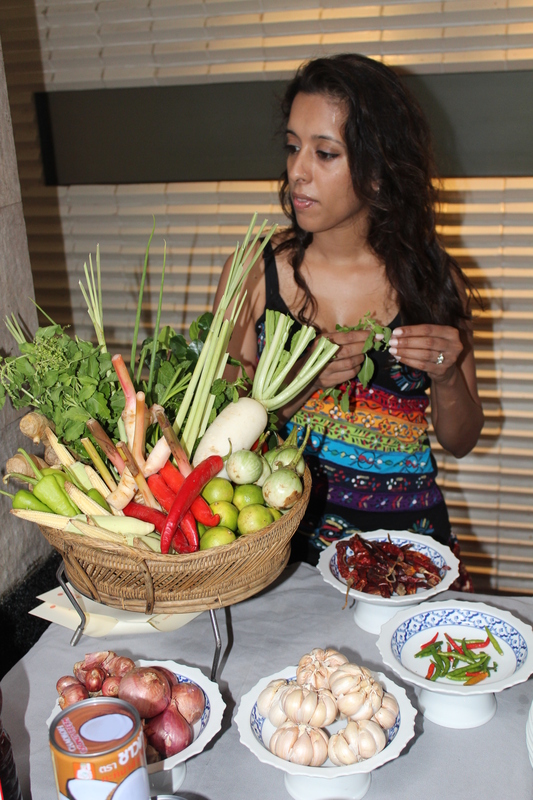 There were 20 – 30 little bowls of every Thai ingredient imaginable, there were bottles, tins and jars of various spices and sauces. He was incredibly thorough and talked me through every ingredient, offering tastes of each item that I did not know well. 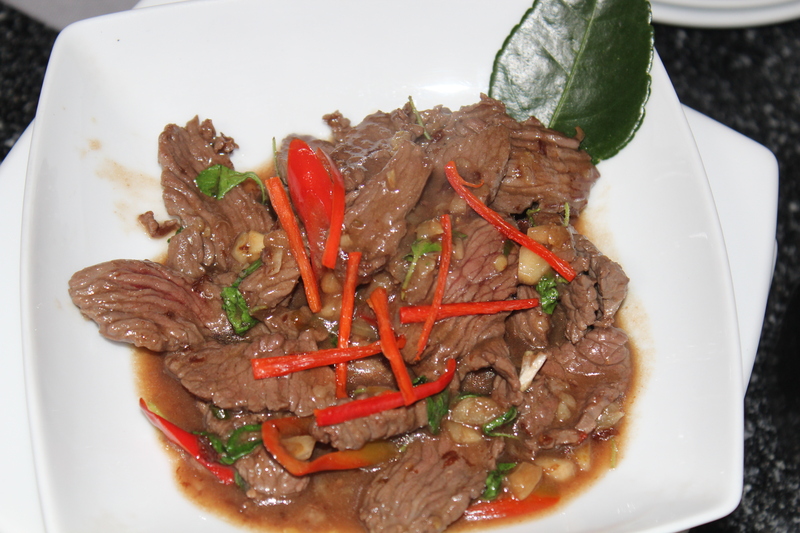 Stir fried ostrich was the first dish – ‘Pad Krapow Nok’. Ostrich is called Nok in Thai which means bird since there is no word for it. The meat looked like beef fillet and I wasn’t expecting much. Although we do find ostrich in South Africa, I have never found it appealing enough to cook. Heaps of garlic were tossed into the hot wok and sauteed with chilli….I just love aroma of garlic….it makes me go weak at the knees. The ostrich was prepared in a flash….oyster sauce, sugar, fish sauce and basil were thrown into the pan. This dish was amazing – the meat is richer than beef. Fresh ‘hot’ basil leaves, garlic with chilli packed a flavoursome punch creating a bit of competition between Rob and I when it came to the tasting. Fry the garlic and chilli in oil over high heat. When the garlic starts to turn brown, add the ostrich and stir constantly. Keep stirring until all the juices have evaporated. Add the sugar, oyster sauce, chicken stock and fish sauce. Stir a few times to mix the leaves with the meat, then remove from the pan and garnish with sliced chillies. Next was the Chu Chi Gang which is rock lobster with red curry. This was also a dish that was prepared at our wedding feast. The tender lobster meat soaks up the flavours of the lime leaves, lemongrass and chilli. The combination of the spices and coconut milk with lobster was heavenly. Our last dish for the day was Pla Goong – a spicy prawn salad. For those of you who don’t know Thai salads, never order a ‘hot’ salad. Birds eye chillies are added and they can make you weep. I am still not sure exactly what makes the chillies in a salad so much more potent – maybe sometimes its because the chillies are bashed in a mortar first. I had a beef salad last night….being a sucker for spicy food, I ordered medium spicy. I had to eat a toasted sesame burger bun to try to calm my taste buds down. So when Chef Kanit asked how spicy….Rob and I both emphatically said mild! It was a good choice…the prawns were delicious and succulent. This is going to be my favourite starter when I get back to South Africa! The trouble with all this eating at cooking classes is that I am now lying in bed…..moaning from over eating! Martin Kunzmann, the resident manager at Amari Samui, is meeting us in about five minutes to lead us on a search for Durian. I have been complaining that I could not find Durian at the market so he very kindly offered to assist us! I think we (and the moped) are going to take some strain on the hills this afternoon!